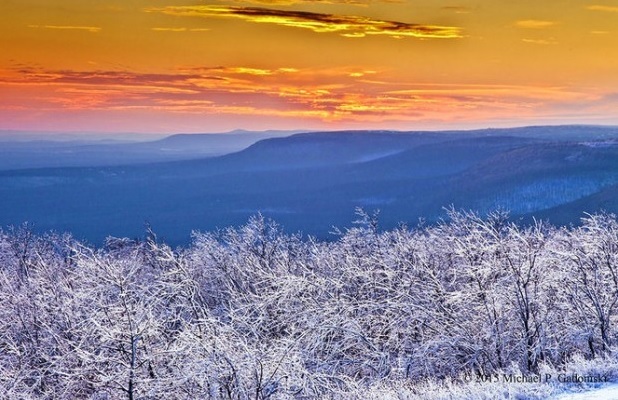 Visit PA in the Fall and Winter and experience the never ending list of things to do for the family, friends or just for that romantic vacation. ​PA Is the place to be! 2 king beds, 1 queen sofa, 2 sofas, 1 cot. 2 full baths. Over 2,000 sq. feet. Deck and hot tub. Gardens and Koi pond. Hot top driveway. Porch. 2 car garage. Ice Fishing, snowmobiling, x-country skiing, fishing, hunting, and summertime fun. Access to pool and other services. ​Glendale Lake and PA State game lands insure great fishing and hunting. Rock Run ATV park nearby; Blue Knob Ski Area is less than an hour drive. Great motorcycle and sports car touring. ​A three bedroom, two bath cottage in Pennsylvania's Laurel Mountains. Enjoy a scenic drive to two Frank Lloyd Wright masterpieces, Fallingwater and Kentuck Knob, plus outdoor activities for all seasons. Stores, restaurants, museums and more are just minutes from historic Ligonier, PA. The house was built as a vacation home in the early 1930s and eventually re-imagined into a second life as an artist's home and studio. Guests enjoy original works of art throughout the home and even incorporated into the building itself. Fantastic faux finishes, hand painted floors, decoupage, mixed media pieces and so much more are cradled within a comfortable and eclectic blend of cottage antiques pieces and modern amenities. of kayaks and canoes for your paddling pleasure. First floor, mostly open yet cozy. Wonderful mix of antiques and comfortable styles. Bedroom 1 with queen size bed faces the lake – wake up to the sounds of the families of ducks. thousands of croaking peepers, wild turkeys deer and black bear. The Estate feels like your own private oasis in the middle of nowhere but is located on the hill above the town of Mansfield. The Estate is a wonderful place to bring the entire family, including your children. Sitting ion the front porch looking at the tranquil setting will feel like days gone by. ​This three story row house comes with two visitor parking passes.The house was recently remodeled, boasting a top floor bedroom with independent heating and cooling, two twin beds and a private bathroom also heated independently. The second floor features two bedrooms with plenty of closet space. One bedroom has a king size bed and the other has a queen size bed. A full bathroom with special infrared heating serves the second floor and a laundry room houses a full-size washer and dryer. 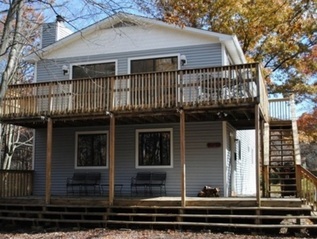 3 Bedroom, 1 Full Bathroom Cabin On 3 Wooded Acres. WINTER SPECIAL - STAY 2 NIGHTS, GET THE 3RD NIGHT FREE-JANUARY THRU APRIL. Bear Tracks Cabin is in a peaceful mountain setting. Secluded enough to get away from it all, but within driving distance to activities. Wrap around deck with rocking chairs, picnic table, children's picnic table, chairs and benches. Fire ring with wood provided for campfire. Modern Lakefront Homes with Great Amenities. If you envision a getaway in the heart of the Poconos, located right on a beautiful 128 acre lake and nestled in a private wooded community, look no further. The features & design of my homes have been carefully thought out so you can enjoy a relaxing, comfortable and memorable trip while enjoying the tranquility of the outdoors. 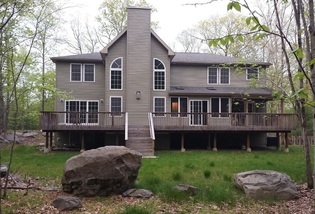 4 bedroom, 2.5 bathroom Colonial Style Lakefront HomeThis home is a renovated 4 bedroom, 2.5 bathroom Colonial style home located in the heart of the Poconos. This lakefront home has been completely re-modeled with modern amenities and ultimate comfort & entertainment in mind. The home features 4 Flat screen high definition TV’s, complimentary wifi internet access, plush sofas, a pool table, a gas fireplace(seasonal), remodeled kitchen with stainless steel appliances, modern style furniture & a beautifully landscaped backyard overlooking a 128 acre natural lake. Cozy 5 bdr lakefront. Sleeps 21. Perfect for 5 families w/kids /group of friendsCozy 5 bedrooms, freshly renovated house for rent. Sleeps 21 people. place to sit and enjoy the peace and quiet of the mountains Home is equipped with Japanese jetted soaking tub in the master bedroom, two bath, cathedral ceilings, stone (wood burning) fireplace, and modern fully equipped kitchen. Enjoy watching the large flat screen TV on the wall with expanded cable. Beautifully furnished and decorated. Walk to lake, beach, pool and tennis. Sleeps 6. Year round week long, mid-week or weekend getaways can be yours in the best mountain homes. If you are an adventurer or just looking for a relaxing get away, our houses provide ample space for large groups or multiple families. Each property is unique however; they all have large flat screen televisions, outdoor gas grills (tank provided, propane not guaranteed) pool tables, Wi-Fi, laundry facilities, and hot tubs. Not only do we stay in our houses, we love the Poconos and are happy to help you decide which property will best suit your needs. If you'd like to learn more about this or any of our houses, please call me at 631-286-6300. Full kitchen, wood burning fireplace in living room, master bedroom has king size bed, second bedroom has 2 twins. Sofa bed in living room. Overlooks and steps away from pool, jacuzzi and kid's pool ( Opened Memorial Day through Labor Day). Beautiful view of lake from living room and dining area. Mountain Lake Club has nice beach area, another pool, small boating, fishing. For skiers in winter, slopes are just a 2 minute drive (approx. 1/2 mile), or 10 minute walk. restaurants, and tons of outdoor adventure sports, including hiking, biking, skirmish, white water rafting, and more! Hickory Run State Park, which boasts beautiful hiking trails and picnic areas, as well as the gorgeous Hawk Falls and adventurous Boulder Field is located just 4 miles away!! My wife and I are pleased to extend a warm welcome to you, your family and friends. If you are looking for one of the Nicest Homes on Camelback Mountain for your Pocono getaway this is your best choice. The house is centrally located in the heart of the Poconos and only 2 minutes to Camelback skiing and snow tubing . It is also only a few minutes from The Crossings Shopping Outlets, Mount Airy Casino and some great restaurants and local attractions. Come and enjoy our spacious 5 BR 2 BA home in Towamensing Trails just 5 blocks from the beautiful 194-acre lake and clubhouse, tennis courts, basketball court, sand volleyball court, restaurant and game room. ​We welcome you to enjoy our new beautiful five bedroom mountain home located just a few blocks from the ‘Ski Big Bear’ ski resort. This 4800 square-foot home is in the four seasons community of Masthope and is designed for multiple families to enjoy. The house would be great for family reunion's, Birthday parties, a Girl’s weekend getaway, Men’s golfing trips or a perfect setting for a large group of family or friends to spend time together. Due to the 1600 square-foot game room with shuffleboard, ping-pong, air hockey, pool table and poker table, our mountain home is well-suited for parents with teenage kids. This property has a minimum age requirement for renters. Most Romantic Getaway: Note: Please do not ask about one night stays OR Pets. We absolutely don't do them. Absolutely no exceptions. Situated on one of Bucks County's most fabled properties, in the Historic Hamlet of Phillips’ Mill just 1 ½ miles north of New Hope, PA, sits this very private Medieval English Village. Renowned architect, painter, woodworker, and iron worker, Morgan Colt, built this extraordinary village at the turn of the 20th century to be his residence. As you walk thru the village, you feel as though you’ve stepped back in time and you’re now in England 200 years ago. This large property has four cabins evenly spaced on a two acre piece of property with a view of the lake.